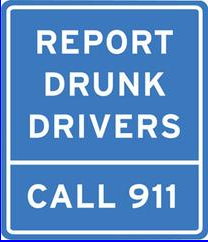 Just a reminder... Don't start your holiday weekend with a drunk driving arrest! The Costa Mesa Police Department announced today that they will be conducting another in their series of DUI checkpoints somewhere in the city beginning at 8:00 p.m. Friday, May 24th and continuing through 3:00 a.m. Saturday, May 25th. You can read the text of their announcement HERE. As you read in that message, DUI Checkpoints such as this one produce a great "return on investment" in addition to keeping dangerous impaired drivers off the roads. Have a wonderful holiday, but don't drink and drive. As we reach the cusp of the Memorial Day holiday today and look forward to three days of recreation and relaxation, I hope you all will take a few minutes to remember just what this day is all about. You can read the Wikipedia description and history of the holiday HERE. I visited this place during a visit to Europe many years ago. It's the American Military Cemetery just a couple kilometers south of Florence, Italy - the final resting place of more than 4,000 American soldiers who died nearby during World War II. It's a beautiful place - a chunk of the USA - and is meticulously maintained to honor all those men. 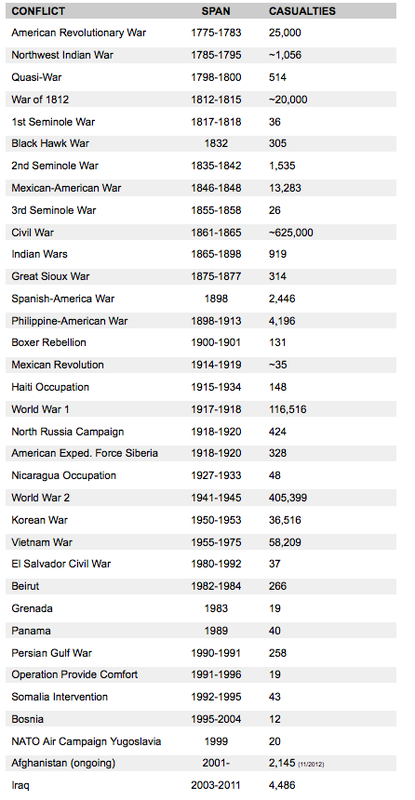 The chart below will give you an idea of how many men and women have given their lives in the defense of our country over the past couple hundred years. As you scroll down that list it might help you get some perspective as we consider where our young men and women serve and die for us today. One of those is Costa Mesan Jose Angel Garibay, the young Marine who died a decade ago, on March 23, 2003, in Iraq. Garibay, an illegal alien who hoped for citizenship through his military service, planned a career in law enforcement. He was buried at Riverside National Cemetery on April 11, 2003 with full military honors, HERE, was awarded posthumous citizenship and was named honorary Costa Mesa policeman by then Police Chief Dave Snowden. Please take a couple minutes to view this video clip to honor our fallen men and women. Regardless how you feel about a particular war or police action, the men and women who fought and died in them deserve your respect. Next Tuesday Is Going To Be Hectic! Y'all better enjoy your holiday weekend because Tuesday is going to be one hectic day! Although the Finance Advisory Committee meeting, originally scheduled for 3:30 at City Hall, has been canceled, it's still going to be a very busy afternoon/evening on that first day back. At 4:30 in City Council Chambers the City Council will hold a Budget Study Session and this one will be worth the price of admission. 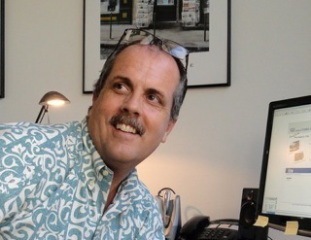 Director of Finance and Information Technology Bobby Young presented the Preliminary Budget to the council last week. You can read all 290 pages HERE. That document, prepared with all the priorities given to Young earlier, carried a $12 million deficit, so it's going to be interesting to see what kind of discussions will take place Tuesday as the council tries to deal with that very significant shortfall. In years past this kind of study session might drag on for a couple hours, but there is a Planning Commission meeting scheduled to begin at 6:00 that kind of slams that door. The establishment of a 4th "Neighborhood Improvement Program", HERE. An assessment of the new Capital Improvement Programs for the next fiscal year and out to 2020, HERE. The consideration of the new Public Nuisance Ordinance, that will then be forwarded to the City Council for adoption, HERE. And the Housing Element of the General Plan that has a tight time schedule, HERE. MORE, INCLUDING A "MEET THE MAYOR"? There are a few other meetings next week but there is no confirming agenda available yet. And, theoretically, there will be another in the series of "Meet The Mayor" gatherings at some site as yet not announced on Thursday. 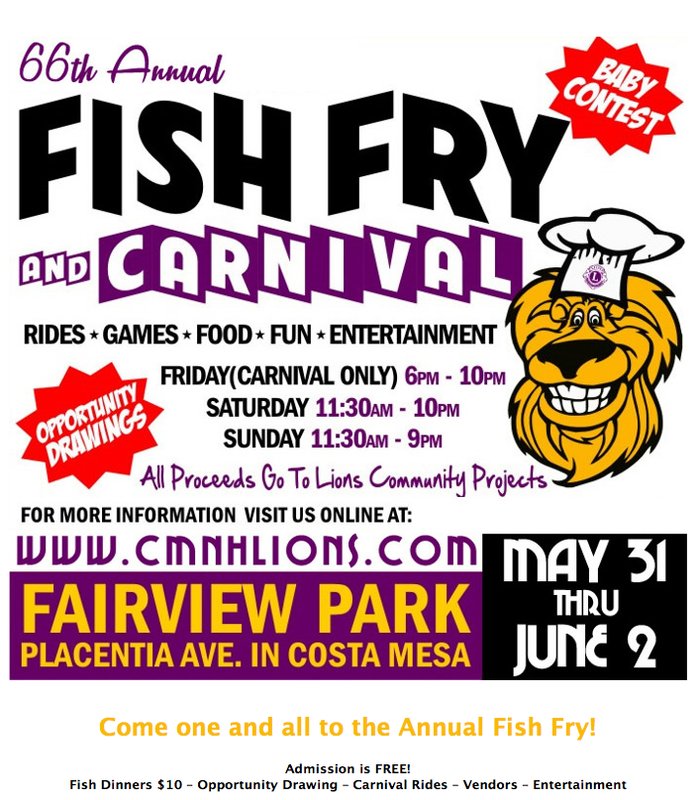 Then, beginning Friday, we have the 66th Annual Costa Mesa/Newport Harbor Lions Club Fish Fry, which continues through the weekend and, for the first time, includes the Costa Mesa Community Run on Sunday, June 2nd. Whew! According to a story in the Daily Pilot by Bradley Zint, HERE, an independent audit of the contract trash hauler, CR&R Environmental Services, commissioned by the Costa Mesa Sanitary District Board of Directors late last year, raised a few questions. Zint does a good job of describing the issues involved. I did not attend the meeting due to a prior commitment, but have spoken to folks in attendance. The results of the audit, which apparently found 80% of the responsed to 31 questions posed by the Directors when they commissioned the audit to be satisfactory, was formally presented to the Sanitary District Board Tuesday at the regular meeting of their Operations Committee. This meeting functions much the way city council study sessions operate. The committee hears issues but, since it is not an official meeting of the full board, it cannot provide direction to the staff nor vote on any issue. 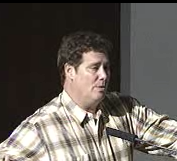 According to Zint's story, de-frocked Sanitary District director Jim Fitzpatrick was in attendance and, based on reports from the scene, somehow managed to hyperventilate his way through it. The questions and statements attributed to him by Zint sound like what he would say. It's likely he will never recover emotionally from resigning from the board under pressure. That's OK - he brought it on himself when he violated the rules by ignoring legal counsel and holding a seat on both the CMSD board and the Costa Mesa Planning Commission simultaneously. The audit is on the agenda of the CMSD Board's regular meeting tomorrow afternoon. At that time it is anticipated the members will give it a thorough vetting and most likely will direct staff to further investigate some of the issues that seemed not to be 100% satisfactory if they have not already done so. I suspect Fitzpatrick - who apparently still has plenty of time on his hands these days - will probably show up and vent his spleen again. As a resident and ratepayer that is certainly his prerogative. However, it is hard to view him as other than a bitter man who lost his seat and just can't let go of that defeat - kind of like a playground whiner who wants to make the rules or he'll take his ball and go home. Once the CMSD Board has made a decision on how to proceed after reviewing the audit I'll report on what I know. This morning the Costa Mesa Police Department issued a press release detailing the results of a sweep conducted last week with the Orange County Probation Department aimed at those criminals released back into our community as a result of Assembly Bill 109 (state prison realignment). It came as no surprise to me that more than half of those located and audited - 11 out of 21 - were re-arrested. According to police sources, sweeps such as this one will occur periodically to make sure those criminals released under the re-alignment program are fulfilling the terms of their early release and have not committed other crimes. For our folks in the CMPD and other law enforcement agencies this must be a little like hitting a tennis ball against a backboard. They hit it (catch the crooks) and it just comes right back at them (following re-alignment release). And, of course, there is the issue of having 20% fewer sworn police officers to deal with all criminals in our city... That's OK with our current council majority, though. As long as we get the streets paved they're happy as clams. We'll find out at the Budget Study Session next Tuesday just where their priorities fall. You can assume they'll find money for more playing fields and another $1million for CEO Tom Hatch's slush fund, but how much will they allocate to more police officers? On Thursday, May 16, 2013, the Costa Mesa Police Department partnered with the Orange County Probation Department in a collaborative effort to conduct compliance checks on those offenders subject to Post-Release Community Supervision (PCS), per Assembly Bill 109 (state prison realignment). These checks were designed to locate and audit the activity of those local criminal offenders residing within Costa Mesa whom are under the supervision of the Orange County Probation Department. Officers contacted twenty-one PCS offenders and persons living locally in the Costa Mesa area. The compliance checks resulted in eleven offenders being arrested for violations of the conditions of their Post-Release Community Supervision and/or new criminal law violations. Steven Gray, 30 years old, of Costa Mesa - Possession of controlled substances, possession of paraphernalia, violation of probation / PCS terms. Freddy Ramirez, 31 years old, of Costa Mesa - Possession of controlled substances, possession of paraphernalia, violation of PCS terms and warrants. Daniel Peckenpaugh, 24 years old, of Costa Mesa - Warrants. Anna Giss, 31 years old, of Laguna Woods - Possession of drug paraphernalia and probation violations. Justin Markin, 32 years old, of Laguna Woods - Probation violations. Jamie Bergstrom, 30 years old, of Costa Mesa - Possession of drug paraphernalia, violation of PCS terms and warrant. Ashley Lyons, 27 years old, of Costa Mesa - Possession of controlled substances and probation violations. Krystal Martinez, 24 years old, of Costa Mesa - Violation of PCS terms. Ryan Gobrogee, 29 years old, of Costa Mesa - Violation of PCS terms. Ryan Walker, 24 years old, of Newport Beach – Misappropriation of access card. 17 Year Old Juvenile of Costa Mesa - Possession of controlled substances. 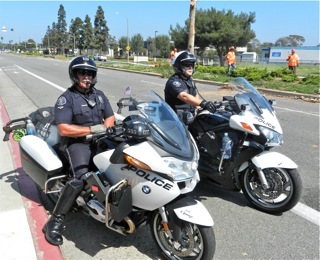 The Costa Mesa Police Department will continue to collaborate with Orange County Probation to conduct similar, future compliance checks of PCS offenders living in the Costa Mesa community. 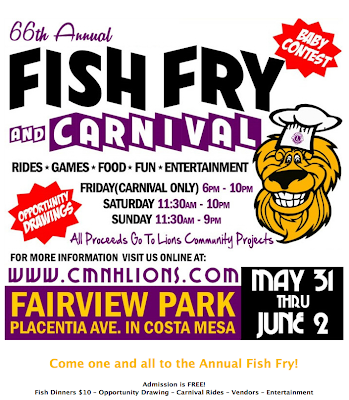 Fish Fry/Community Run Coming Up! 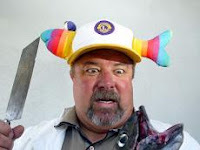 Just a little reminder for you that President Mike Scheafer invites you to the 66th annual Costa Mesa/Newport Harbor Lions Club Fish Fry - coming up next weekend. Festivities begin Friday, May 31 and continue through Sunday, June 2nd. Here's a little graphic to tell you all about it. Also, you can go to their website, HERE, for more information. 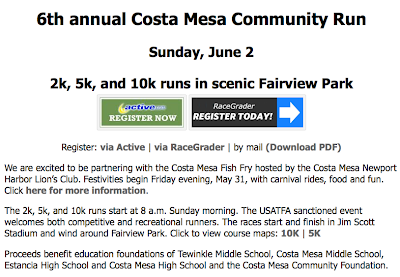 PLUS THE COSTA MESA COMMUNITY RUN, TOO! 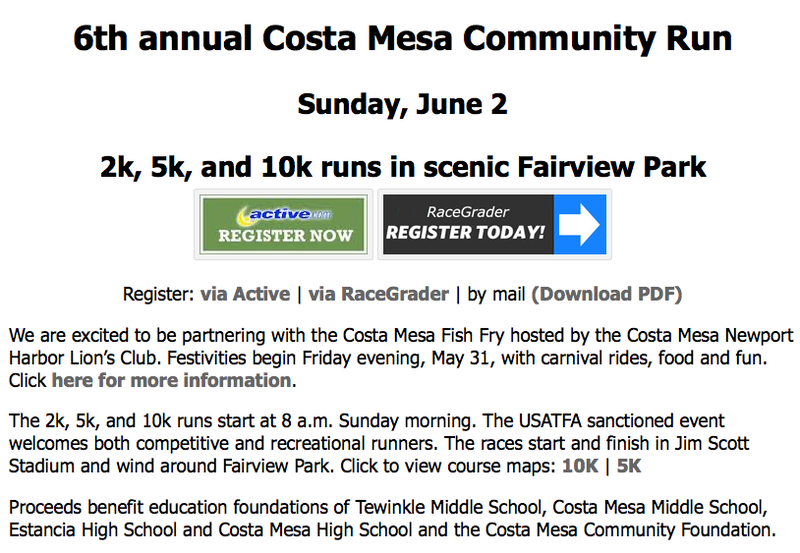 And, this year, the Costa Mesa Community Run will be held in concert with the Fish Fry on the Sunday of that weekend. You can read more about it on their website, HERE. At the very brief Costa Mesa City Council meeting Tuesday night the three members of the council in attendance - Wendy Leece, Sandra Genis and Gary Monahan - approved the proposal by staff authorizing the team of Mercy House/Wakeland Housing and the use of up to $500,000 in HOME funds. You can read Jill Cowan's coverage of the issue in the Daily Pilot, HERE. This decision will be sent to the the federal Housing and Urban Development department for review and approval. Upon the receipt of that approval the approved team will proceed to identify suitable locations for supportive housing homeless in our city. Among the other items discussed during the meeting was Assistant CEO Rick Francis' announcement of the selection of Gary Armstrong as the Economic and Development Director/Deputy CEO - previously discussed on this blog last Friday. He will start to work for us on June 10th. Leece ran an efficient meeting, finishing at 7:00 p.m. sharp. I missed my target by 30 minutes. Darn. The next council meeting will be the Budget Study Session on Tuesday, May 28, 2013 at 4:30 in Council Chambers. The Costa Mesa Parks and Recreation Commission meets again on Thursday, May 23, 2013 at 6:00 p.m. in City Council chambers at City Hall and has a whopper of an agenda facing them... I'm not surprised. Chairman Byron de Arakal has given us strong signals that he wants to make the most of his two-year tour on the commission, so this agenda, HERE, looks like he's getting a running start. 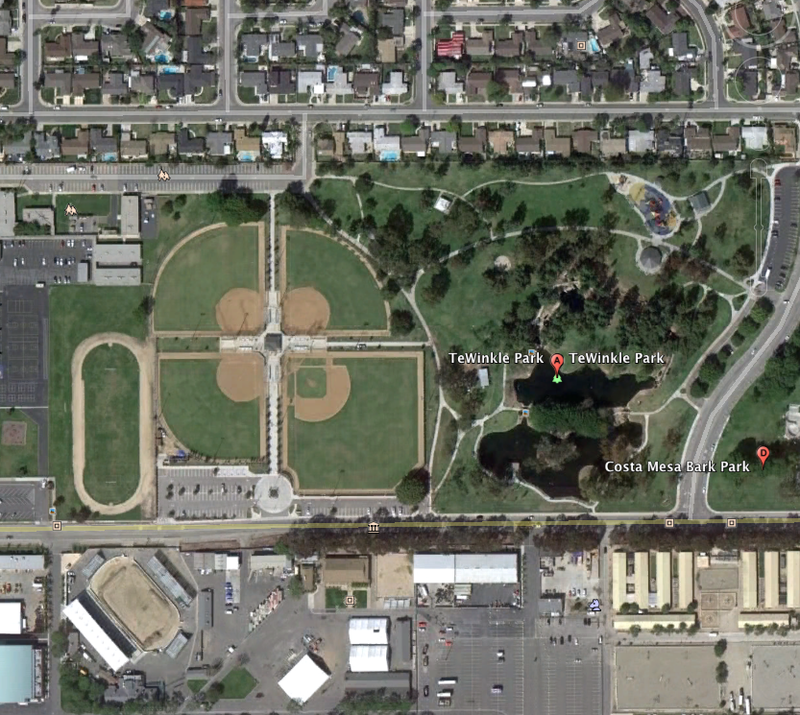 In addition to five tree removal requests, the meeting starts right off with Old Business (a), a discussion of Maintenance Costs Associated with the Costa Mesa Bark Park, HERE. Under New Business (a) the commission will discuss fees for Youth and Adult Classes, HERE. New Business (f) is the discussion of Athletic Field Use Allocation Policy Recommendations, HERE. New Business (g) is a review of the Proposed Capital Improvement Program for fiscal year 2013/2014 through 2019/2020, HERE. As you can see, it's going to be a very challenging agenda to tackle in one bite. Will make for some interesting watching. 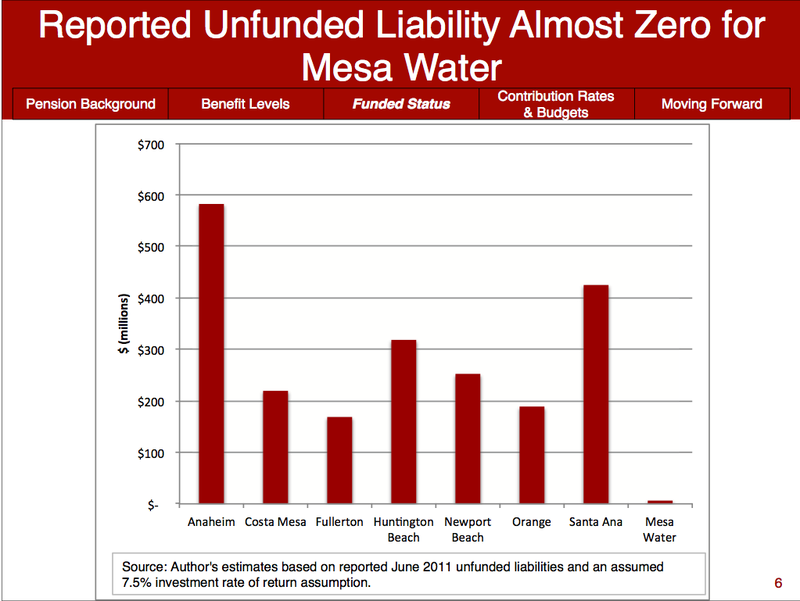 At the meeting at the Mesa Water District Tuesday afternoon, consultant Joe Nation was supposed to present some pension numbers to the Mesa Board that look very favorable. You can find the graphics from his presentation HERE. I did not attend the meeting, nor have I had any first person reports from the site, but I can share with you my observations of the information Nation was going to use. The chart shown here is only one of several used to present his material. As you can see, this study really doesn't compare apples and apples... it compares Mesa Water District - a small, special district - to several local municipalities, including Costa Mesa. While these numbers are interesting, a more representative presentation would compare Mesa to other special districts in Orange County - like the Costa Mesa Sanitary District, for example. To make this presentation all Nation had to do was plug the Mesa Water numbers into his spreadsheet used for his presentation to Costa Mesa. 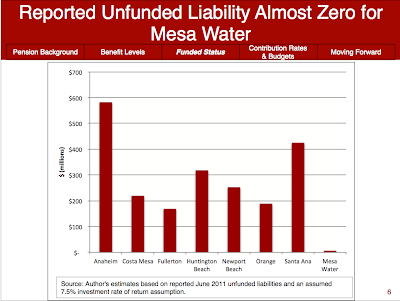 Don't interpret my comments as a denigration of the position Mesa Water finds itself in.. the numbers are good, especially when compared to municipalities that can't simply vote to raise rates to cover budget shortfalls, including pension payments.